Ask any manager and they’ll agree that people issues are some of the most important ones they face in their day-to-day routine. What can an organization do to assure they’ve got great practices? The following are nine essentials that must be in place to ensure success. 1. Corporate culture. Whether an organization realizes it or not, it has a culture. Elements that define your culture is leadership style, communication, the work environment – formal or informal – and how mistakes are handled. Culture sets the tone for everything you do and everything you stand for. Leaders matter in any organization because they are so visible. Be conscious about the culture that you set for your organization. Manage it through your culture and your actions and hire staff who will fit it. 2. Strategic staffing. A key success factor for any organization is having the right people in the right jobs. Hire for attitude and train for skill. Know your culture, have clearly written job descriptions, and train your managers to interview so they can find people who will be successful in their jobs and in your organization. Follow best practices, such as checking references to be sure that you bring in the right people. 3. Welcoming new employees. There is a wonderful time between when you hire a new employee and when the person starts. It’s an opportunity to reinforce how glad you are that they accepted your offer. Have the hiring manager send a welcoming letter or e-mail before they start. Be ready and carefully plan out their first week. Meet with them, take them to lunch, introduce them to co-workers, assign a co-worker to be their mentor and have all of their resources (phone, computer, e-mail address) ready for them. 4. Employee engagement and retention. Engagement and retention are inextricably linked. Focus groups and stay-interviews can reveal why people want to come to work every day. Build on those reasons to encourage excitement about your organization. Don’t forget rewards and recognitions programs. The most incredibly affective recognition strategy is saying thank you – letting employees know you appreciate them. It costs nothing and can have a huge payoff. 5. Total rewards programs. Rewarding employees goes beyond wages. It includes indirect compensation such as benefits, rewards and recognition, and flexibility. Your total rewards package should link to your recruiting strategy as well as your goals and objectives. These programs should be compatible with your culture, appropriate for your workforce and industry, and be fair and equitable both internally and externally. Communicate with your employees and make sure they understand that their benefits and other indirect programs that you offer are part of their overall compensation package. Take the time to educate your employees about their benefits. They will be very grateful. 6. Employee development. Development helps employees to be effective in their current jobs and prepare for future opportunities that help the organization to grow. Training, coaching and mentoring, and stretch assignments are just some of the ways to develop employees. Development opportunities must align with the company’s mission, goals and objectives, so use measurements, benchmarks and metrics to assure they are. Giving your employees the opportunity to grow and succeed is a good value proposition and will help you to grow a successful company. 7. Performance reviews. Performance reviews are just a part of performance management – an ongoing process of planning, continual monitoring and frequent feedback. Managing performance is crucial to employee motivation and feedback is an integral part. Feedback lets employees know they are making a contribution and doing things right. Make sure expectations are clear and don’t assume your employee’s know them. Performance reviews should focus on outcomes and results. 8. Positive employee relations. Policies communicate expectations and create the framework for fair and respectful treatment. They assure consistency in making decisions while recognizing that each situation is unique and requires flexibility. Benchmark with other companies in your community and industry to understand best practices, but develop policies unique to the needs of your organization and your employees. Communicating with employees is critical to positive employee relations. With communication methods changing rapidly with technology and social media, it’s important that you deliver messages in a method in which your employees like to receive information. 9. Ending the employment relationship. Even in a culture with positive employee relations and frequent, open communication, employment relationships end. If the company is initiating the termination, it’s important to be fair and consistent. Consider how similar situations were handled in the past. Consider the individual’s tenure and history. Review your policies, but don’t forget to use judgment. Keep other employees in mind. Good performers want to work with other good performers. After a layoff, the employees who are still employed are also impacted, often being asked to take on more work and responsibility. Regardless of the reason for the termination, even voluntary terminations, treat the employee with dignity and respect. Former employees may turn into future employees or they may recommend others with great skills to meet your future talent needs. About the authors: Cornelia Gamlem and Barbara Mitchell are influencers to the HR & Business Communities. 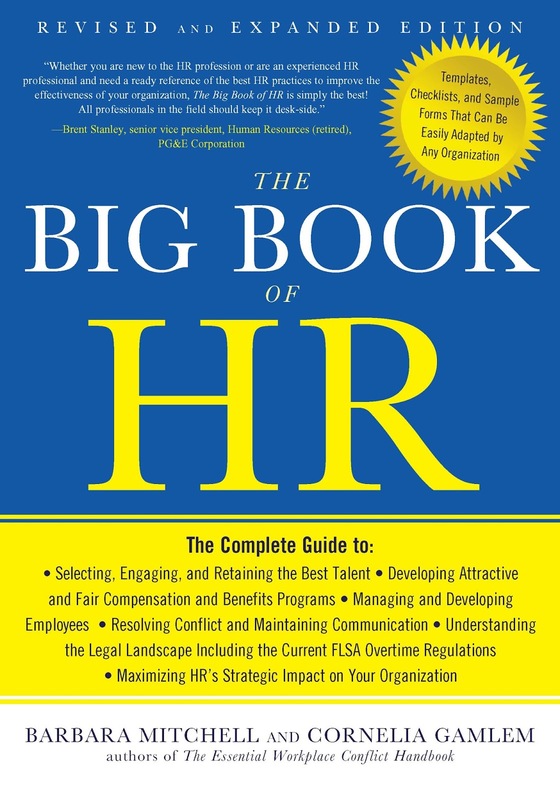 They’ve taken their collective years as Human Resource professionals and consultants and shared it in The Big Book of HR. They’ve also written The Essential Workplace Conflict Handbook and collaborate on a weekly blog, Making People Matter. 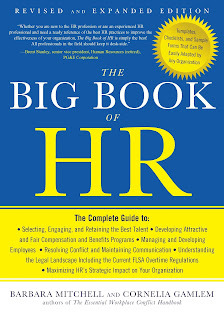 For more information visit www.bigbookofhr.com.